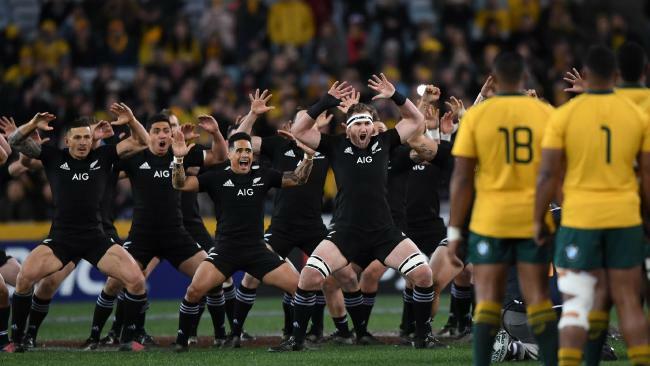 FORMER All Blacks star Andrew Mehrtens believes peripheral aspects to the haka have become a "circus act", and a trio of former Wallabies have weighed in on what if feels like to face New Zealand's traditional pre-match rugby challenge. The haka discussion on Fox Sports' Kick & Chase was triggered off the back of new book, The Jersey, penned by British journalist Peter Bills. In it, former All Black Kees Meeuws was quoted as saying the haka had "lost its mana" and "become a showpiece", and the late, great Sir Colin Meads also slammed its overuse, saying "we were haka-ed out there for a while and still are". Several All Blacks and Wallabies have since leapt to the haka's defence ahead of Saturday's opening Bledisloe Cup Test, including TJ Perenara and Will Genia. Mehrtens, who labelled the haka as "too commercialised" in Bills' book, qualified his comments by stating the challenge was an important part of both New Zealand and All Black culture. But the former five-eighth argued it was an "indulgence" for New Zealanders and said opposition teams should be able to respond to their own liking. In 2011, France were fined $5000 for advancing on the All Blacks' haka before the Rugby World Cup final. "It's a challenge, it's laying down a challenge saying we're ready if you are," Mehrtens said. "I still believe opposition teams should be free to receive that challenge how they like. "I don't like the fact that there's 20, 30m between the two teams, cameras, microphones, photographers lying there taking shots. "I think that part of it has become too much of a circus act. 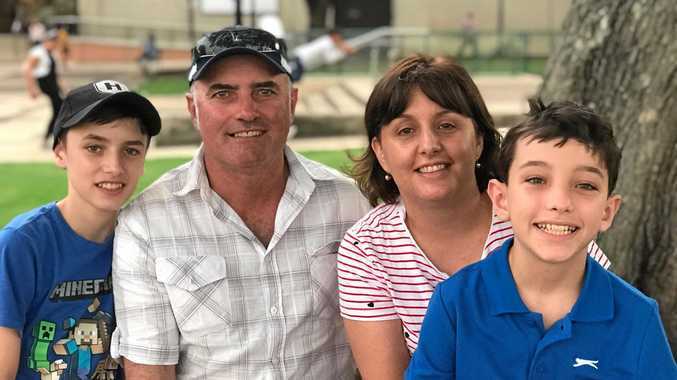 "It's still important for us to do, but it's important for us to do it in a way that says look, this is part of our culture but we realise it's an indulgence." The Wallabies were bombarded by haka during the 2011 World Cup in New Zealand. "Every time we hopped off a bus or a plane it was performed in front of us," former Wallabies winger Drew Mitchell said. "For me, one of my greatest memories of playing against the All Blacks was facing the haka. "I think it's a tremendous part of our game and it's very unique and I think the All Blacks, more than any other sporting team, from New Zealand, perform it the best. "But I think it should be reserved for those Test matches and those sporting occasions and not outside of that. "It shouldn't be commercialised - it is a challenge before a contest." 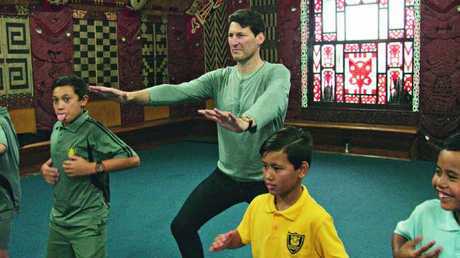 Former Wallabies captain John Eales travelled to New Zealand to learn about the haka. Wallabies legend Tim Horan, meanwhile, had nothing but praise for the haka, while joking that he used to enjoy staring down Mehrtens before a Test match. "I used to love watching it and loved being there, 10 metres away from it and it's a really important part of the game," Horan. "Young kids, whether you're a Wallabies supporter or an All Blacks supporter, identify rugby when you see the haka. "Of any sport, in the world, it's the best pre-game entertainment anywhere." During a chat with the Fox Rugby Podcast, former Wallabies captain James Horwill had some interesting insights into how opposition prepare to face the haka. "Teams I've been involved with, it has been mentioned about what we do post-haka and it's spoken about, taking a bit more time between the end of it and before the game kicks off. "Some teams over the years have even done handling skills, passing skills just on the sidelines or in their tracksuits. 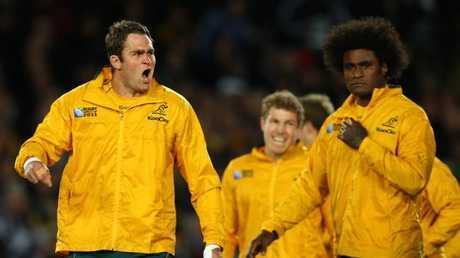 Wallabies captain James Horwill prepares his team to face the haka in 2011. "It was something brought in in the John Eales era, where they took the tracksuit off and took their time. "That certainly wasn't done by accident and we were the same. "We spent time talking about it and how we can - not combat it - but I guess bring the control of the bit before kick-off more into our favour, rather than allow the Kiwis to be able to control that time just before kick-off. "Because obviously the haka, it's run on their time, whenever they finish is when the game can kick off. "And so we looked at maybe we can control that section of time before kick-off." Current Wallabies squad member Ned Hanigan grew up in country NSW mimicking the haka. Last year he told foxsports.com.au that captain Michael Hooper came up with the idea of forming an arrow to meet the All Blacks head on. "Hoops just said 'follow us in here,' and we all thought 'yeah, righto, that sounds like a good idea,'" Hanigan said. "That's how they sort of form up so we thought we'd meet them head on. "It was a collective thing, our leader made a call and we all backed him. "You look at it and the passion that they put into it, when you're there in front of it, it obviously pumps you up because they're getting ready to play you. "The whole experience was something I'll never forget."